We arrived at RAF Snaith, 51 Squadron, 4 Group, on 27th May 1943, fresh and green from 4 engine Conversion Unit RAF Rufforth, near York. We were attached to C Flight, commanded by Squadron Leader Charlie Porter, a Navigator. The Squadron was commanded by Wing Commander Franks. 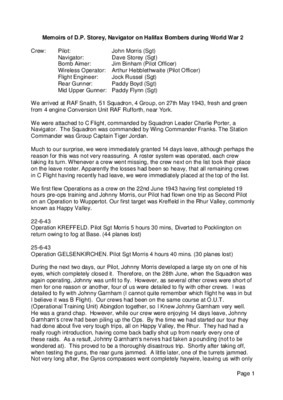 The Station Commander was Group Captain Tiger Jordan. taking its turn. Whenever a crew went missing, the crew next on the list took their place on the leave roster. Apparently the losses had been so heavy, that all remaining crews in C Flight having recently had leave, we were immediately placed at the top of the list. on an Operation to Wuppertot. Our first target was Kreffeld in the Rhur Valley, commonly known as Happy Valley. During the next two days, our Pilot, Johnny Morris developed a large sty on one of his eyes, which completely closed it. Therefore, on the 28th June, when the Squadron was again operating, Johnny was unfit to fly. However, as several other crews were short of men for one reason or another, four of us were detailed to fly with other crews. I was detailed to fly with Johnny Garnham (I cannot quite remember which flight he was in but I believe it was B Flight). Our crews had been on the same course at O.U.T. (Operational Training Unit) Abingdon together, so I Knew Johnny Garnham very well. Operation COLOGNE. Pilot Sgt Garnham 4 hours 40 mins. gunner, Sgt Allan Massey, who turned out to be a great gunner. Shortly after this, we again had 14 days leave, because we had reached the top of the list owing to the continuing heavy losses. In a matter of a very few weeks almost all the faces you knew would disappear and be replaced by new and strange ones. Operation HAMBURG. Pilot Sgt Morris 5 hours 40 mins. Sometime during this month (July) a large part of the station bomb dumps blew up. It would be sometime between 1:30 and 2:00 pm, because we were all in the mess (Sergeants), having had lunch and standing around and chatting. Suddenly there was a tremendous explosion and the whole building rocked like a boat on the water. Everybody made a dive for the floor. We thought we were being raided by the Jerrys. However, when we had recovered from the shock, we all rushed outside and saw this huge column of smoke coming from the area of the bomb dump across the other side of the aerodrome. that all bombs in that section of the dump had exploded, volunteers went into collect the bodies, but there were no bodies to collect; only bits of rotting flesh alive with maggots. It has been a blazing hot week and the flies had got to work with a vengeance. I don’t think anybody was identified, because the pieces found were so small. An odd finger, an odd foot etc. We heard that the smell was beyond description and that many of the volunteers were sick for days after and I could not eat. Naturally, this posed a big problem to the operational ability of the Squadron. However, this problem was solved by bringing in bombs from other Squadrons, For a week or two these were transported by road, as the main railway line which ran close to the bomb dump was closed during this period and all trains diverted onto other routes. We had to take off over the blazing dump on some of the trips, when the wind was in that direction. It was not a comfortable feeling. This raid was somewhat of a disaster owing to the weather. Terrible electric storms were encountered over Hamburg, caused, so I have since read in descriptions of the raid, by the fires caused by this series of raids. I think five in all by the RAF within a week and daytime raids by the US air corps. 40 feet into the air at frequent intervals by the vast currents of air in the totally solid thunder cloud. Lightening flashed all around us continually and static electricity called St. Elmos fire covered the whole of the plane, making it appear that we were actually on fire. This static blue flame leapt from all the propeller blades covering the wings in blue flame and dancing all around the cockpit and the fuselage. Just as terrifying as the vast up-currents and the static fire was the bombardment of the fuselage by huge chunks of ice being hurled from the propeller blades, hunks of ice the size of a leg of mutton. We could not get out of this vast cloud. We tried climbing above it but couldn’t because of the ever increasing weight of ice on the wings and props. We also tried to get beneath it but couldn’t; it was too vast in depth. In desperation we flew in all directions to get free of the cloud and the ice, having dropped our bombs on ETA, which was all we could do, not having the slightest clue of our true position, especially as the magnetic compass was totally useless owing to the huge amounts of electric energy in the cloud. All this was a total disaster for me, the navigator. I had to make guesses about our position (my experience was repeated in all the other bombers). I assumed a position somewhere to the north east of the target and when we finally got into slightly improved conditions, we set course for home from this assumed position. right direction. Once we got within “Gee” range all our troubles were over. I think without doubt this was our most frightening trip. The force of nature could out do anything man might attempt. The vast proportion of losses that night (30 in all) were due to the weather and I have no doubt, many collisions in that impenetrable cloud. It was on this series of Hamburg raids that we first used “Window”, strips of aluminium foil dropped from a special chute by the wireless operator at regular intervals. One or two bundles a minute generally, whilst over enemy territory and two to four bundles a minute in the target area. Each of these strips of foil showed up on the German radar screens as an aircraft creating complete chaos for the Jerry fighter control people. Especially as diversion raids were made on other targets at the same time, also using “Window” to create even more chaos. It would appear to the Germans on the radar screens that there were countless thousands of planes being used and it was impossible to distinguish the difference between the false and the true signals. It made interception impossible except by sheer chance. Altogether a great innovation as far as we were concerned. Operation NURENBURG Pilot Sgt Morris 7 hours 45 mins (16 planes lost) Returned of 3 engines. Operation MILAN Pilot Sgt Morris 8 hours 10 mins (3 planes lost) Returned on 3 engines, landed at Abingdon short of fuel. This raid on the German rocket development base on the shores of the Baltic was one of the most successful raids of the war; completely destroying all three separate targets at the base, the living quarters, the laboratories and the technical work shops. This base was where the V weapons were being developed; both the V1 flying bombs and the V2 rockets. The great success of this raid gained us a respite of at least a year to 18 months. burning below, all combined together to create the greatest firework display one was ever likely to see. Terrifying but beautiful. It was a very clear moonlit night and we could see other bombers all around us. The German fighters didn’t show up in any strength until we reached the target area. They had assumed we were going to attack Berlin and had therefore made for the big city, as we called it. They discovered their mistake too late, by which time we were arriving at Peenemunde. However, the return trip was a long running fight in bright moonlight. We were very very lucky and had no trouble, although we could see other bombers being attacked all around us, only a few hundred yards away. The sky was full of tracer and we could see bombers going down at fairly regular intervals. We lost 40 bombers on this raid. Operation BERLIN Pilot Sgt Morris 2 hours 15 mins (56 planes lost) Abandoned due to engine failure. so close, that the two gunners could plainly see the Jerry pilot pull back his canopy and jump, by which time they had stopped firing. The whole action was over in minutes and the Jerry hadn’t fired a shot. A case of smug over confidence on his part; he imaged he had us cold. was magnificent and reinforced the confidence we already had in them. Our elation was boundless and we were all cheering like mad, with congratulations coming from all and sundry. We completed the trip in very high spirits. By 20:17 hours on the same day, we had taken off for Berlin. On the 11-9-43 I was commissioned to the rank of Pilot Officer. Johnny Morris has been commissioned a week or so ahead of me. We encountered very heavy icing on this trip and one of the engines caught fire. Luckily, we managed to extinguish it. air test, we were shown one of the tyres practically burnt away. The ground crew could not understand how we had landed without it bursting. They reckoned us very lucky to be alive. Sgt Jackson (later Pilot Officer) and crew were without a navigator and at a later date my closest personal friend. Pilot Officer Frank Rohrer was attached to this crew as navigator. They were eventually all lost on a raid on the ball bearing factory at Swienfurt on 24th February 1944. I understand they were all buried in a common grave, owing to the fact that they were burned beyond recognition. Frank Rohrer, like so many others, was not yet 21 years old. Diverted to St Andrews Field, Essex on return, due to fog at base. This was a US Army Air Corps base (near Braintree, Essex) accommodating 4 squadrons of Martin Marauder twin engine bombers. It seemed to us that every G.I. had his own jeep. Nobody walked anywhere. We were there until 29th September with engine trouble. They made us very welcome. Another 14 days leave in early October. Operation KASSEL Pilot P.O Morris 6 hours 00 mins (43 planes lost) Returned on 3 engines. Operation DUSSELDORF Pilot P.O. Morris 5 hours 5 mins (18 planes lost) Exchanged fire with enemy aircraft. Sqn Ldr Charlie Porter O.C. C Flight screened and left Sqdr. C Flight taken over by Sqn Ldr Nick Simmonds, another navigator. Flight Commander keeping up the tradition of the Flight. Nick Simmonds was an ex Guards Officer and a Devonian of the Drake/Rayleigh stamp i.e. a typical buccaneer type. He used to have a photograph of himself on horseback in full Guard Officers uniform. This photograph always stood on his desk in C Flight Office. No operations during December for our crew. By this time we were truly a veteran crew and our operations were becoming more and more spread out, this being a deliberate policy, as it was regarded as good for the moral of the younger crews of the Squadron to see it was possible to survive. A new landing procedure was introduced during this month. 23rd December and ferried the aircraft back to base at Snaith the following day. We had to land in fog. This proved to be our most hazardous landing. When we finally hit the runway with great suddenness, we bounced the height of a two storey house. Men who were working on the runway were running in all directions! I flew once during January 1944 with F.O. Love’s crew. F.O. Love was an Australian. I was airsick all the way to the target and back, owing to a massive hangover from the previous night, but it turned out to be one of my best trips from the point to view of navigation; spot on all the way. I had to constantly remove my oxygen mask to clear all the vomit. A very uncomfortable trip but it rather disproved the theory that alcohol lowers the efficiency. Although of course I had got all the alcohol out of my system by the time we took off and was merely suffering from the hangover in the stomach. This trip was abandoned very early on owing to engine trouble. We came back on 3 engines. We took our Flight Commander Sqdn Ldr Nick Simmonds with us on this trip as bomb aimer, owing to the fact that our own bomb aimer, Jim Binham, was in sick bay with lung trouble. Jim Binham was one of the coolest, most unflappable customers I ever encountered. One could not have wished for a steadier crewman to fly with. We missed him greatly. He never flew with us again. However, this proved to be a very eventful trip. Nick Simmonds was one of the greatest characters I ever met. The sort of man one would go to hell and back with and on this trip we did. It was to be a hell of discomfort from the point of view of cold and a nightmare for all navigators. The events started before take-off. Shortly before this trip all aircrew had been issued with service revolvers and ammunition. Quite a lot of crewmen took their revolvers with them on operations, although this was not officially approved of. Nick, being the man he was took his on this occasion and during the usual hour spent at the dispersal point before take-off, he drew the revolver and said “I wonder whether this bloody thing works?” and without further ado he fired a couple of rounds off through the adjacent hedge, aiming at a vague white blob, it being deep twilight by this time. The next morning, a very angry and indignant farmer called in at Station Headquarters, demanding to know who had killed one of his sheep. Needless to say, nobody knew a thing about it! Shortly after we became airborne, we discovered that the aircraft heating system had failed; this was the start of our troubles. Once we reached our operational height of around 18,000 to 20,000 feet the cold was beyond description. The thermometer read -75 below. Although we were warmly clothed this cold penetrated everything. Unfortunately it is impossible to navigate with thick gloves on. All I was able to wear were my thin silk gloves with fingerless wool mittens on top. The computers we used were plated steel, as were the dividers. These were so cold it was like handling hot metal. After the trip I discovered all my fingertips were slightly frost bitten also my heels, strangely enough. One would have expected the toes to be affected more than the heels. The skin was hard and shiny just like a mild burn. I spilt on my navigation chart froze instantly on contact and had to be hacked off with a pen knife before I was able to continue with my plotting. Nick Simmonds tapped me on the shoulder and shouted “Bloody cold up here Storey. I’ve got one heating pipe shoved down my front and another up my arse and I’m still frozen”, naturally as there was no heat coming through at all. Shortly after this, I nearly jumped out of my skin to the sound of machine gun fire, virtually at my elbow. It was Nick, firing the front Lewis gun to warm his hands on the barrel. However, the intense cold was by no means our greatest worry. The met forecast winds were exactly 180º out. Instead of flying into a headwind we had a very strong tailwind in the region of 80 to 100 mph. This meant we were very much ahead of time all the way along the route and had to constantly fly triangular dog leg courses (a manoeuvre to lose time). We flew 3 minute and 6 minute dog legs at frequent intervals, in a desperate attempt to lose time, but no way could we lose enough time with such a tailwind, the complete opposite to the forecast wind, on which the whole timekeeping of the operation had been planned. to Main Force. This was done every 30 minutes over enemy territory, whilst Main Force was out of Gee range. The policy was, that the whole of Main Force should use these broadcast winds to rectify their position, should they find themselves off track and outside the 10 mile wide mainstream. It was a highly successful scheme and of course achieved a greater concentration. 180º different to the forecast winds. I decided quite early on to use the broadcast winds, on the assumption that the Pathfinder Force with their superior equipment knew what they were doing. We were flying on a northerly route, with the purpose of misleading the Jerrys into the belief that we were making for Berlin. The final approach to the target was to be made from a point well north of Leipzig. This turning point was to be marked with a red flare marker, dropped by the Pathfinder Force. When we spotted this flare we found ourselves south west of track and accordingly altered course visually for this marker flare and replotted our course for the target using the broadcast wind. exactly on zero hour, a far better alternative to flying around the target area and being found by searchlights and pumped full of flak for 20 minutes. We arrive back over Leipzig exactly on zero hour and just as the first marker flares went down. We dropped our bombs on the flares and immediately started on the long journey home, against these appalling head winds and still frozen to the marrow. The vast majority of Main Force dropped their bombs in the Berlin area that night, as a result of rejecting the broadcast winds. The raid was therefore a flop, mainly owing to the met forecast winds being so totally in error. We lost 78 planes on this raid. Although, touch wood, we did not suffer from enemy action ourselves this night, but we had already suffered enough from the indescribable cold. Operation STUTTGART Pilot P.O. Morris 8 hours 10 mins (4 planes lost) Landed at Worksop almost completely out of fuel. We were screened after this trip, having finished our tour. by Bob Kennedy, a Canadian and a grand chap. Bob has previously been badly shot up earlier in his tour with another crew; he had the top of one finger shot off and about 13 wounds in one leg and 3 in the other. He joined us to complete his tour and was a grand chap to fly with. I forgot to mention that Paddy Boyd was replaced by Allan Massey, a superb gunner. He and Bob Kennedy made an excellent team in the turrets. Arthur Hebblethwaite, our wireless operator eventually became Wireless Leader for the squadron and therefore left the crew. He was a first class wireless operator, hence his promotion. Arthur was replaced by W.O. Sparkes, commonly known as Sparky. Sparky was doing his second tour and was very experienced, a worthy replacement for Arthur. trouble. He could remain without oxygen for quite long periods without it having any obvious effect on him. Most other fellows would have passed out or shown obvious signs of oxygen lack, but not Jim. Nothing ever seemed to shake him or affect him in any way; always calm cool and collected. One could not have wished to have flown with a finer crew or a finer pilot. Johnny Morris was steady, unflappable and entirely efficient. One of the best pilots 51 Squadron ever had. I count myself lucky to have been a member of such a superb crew. Jock Russell and I kept together when we left 51 Squadron. We were both posted to Kinloss No. 19 O.T.U. Jock was an excellent engineer, always on the ball. I never knew him to be stumped by any problem. It was with a sad and heavy heart that I left 51 Squadron and Snaith, where I had spent the most momentous and happiest year of my life. David Philip Storey, “David Philip Storey's operations,” IBCC Digital Archive, accessed April 25, 2019, https://ibccdigitalarchive.lincoln.ac.uk/omeka/collections/document/15048.